Life is easy on the beach, and so Playtech has made it really simple to get started with Beach Life. At the bottom of the screen, you have a few pebbles that are also buttons to adjust your settings. The “Bet” button obviously lets you adjust your bet size. Choose the number of lines you want to bet on, and how much you want to bet per line. Coin size starts at £0.50, so suffice to say it’s not the cheapest game in town. Once it’s all set, you can hit the Spin button and let things roll. Additionally, the Treasure Chest is a Bonus symbol. To win the progressive jackpot in Beach Life, you’ll need to spin 5 Sun symbols on the 20th payline. That means that if you’re looking to get that ultimate booty, you will need to bet on all 20 paylines when you spin. Yeah, it’s not going to be cheap, but you could be looking at winning a few million. Beach Life’s average jackpot payout is a bit over £2 million, and even the smallest win ever was well over £340k. If you get 5 Sun symbols on any of the other paylines, you’ll pocket a neat 100,000 coins. Beach Life takes things really easy, so there aren’t a whole lot of special features, but it does have a bonus game. Sunken Treasure Bonus: Spin 3 to 5 of the Bonus symbols (that’s the Treasure Chest) next to each other and on any payline, and you’ll open up a bonus round. It’s a Pick Me game, where you’ll open up 3 to 5 treasure chests to reveal additional prizes. Payouts in this round are multiplied by your line bet. Beach Life is a colourful and funky game, even if symbols’ style is starting to feel just a tad dated. It sort of reminds us of the colourful prints you find on Hawaiian shirts. The sound track is similarly easy going. Life on the beach was never about catching up with the latest fads. Just enjoy the present! When it comes to progressive jackpot games, Beach Life is a bit of a secret. It’s been around for more than a few years, and has gifted more than a dozen players with some generous payouts in the millions, but this Playtech jackpot hasn’t received as much love and attention as some of the other games. It might be because the minimum bet per spin is relatively high, and you have to bet on all 20 paylines to have a chance to win the jackpot. It also has relatively few bonus games compared to the jackpot slots being rolled out today. 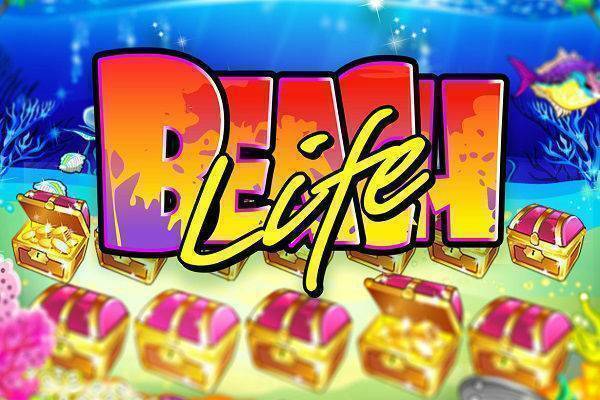 Nevertheless, if you have a bit of moolah in your casino bankroll and are looking for some easy going spins, Beach Life is waiting for you at these friendly slot sites.